Pilgrims once traveled from all over Europe on months-long journeys by foot to arrive here. The ultimate goal of the faithful was to venerate the relics of Saint James (known in Spain as Santiago) that were miraculously transferred to this site in Spain from the Holy Land. During the Middle Ages, this sacred city was equal to Jerusalem and Rome as a pilgrimage destination. Still one of the most revered shrines in Christendom, Santiago de Compostela continues to draw modern-day spiritual pilgrims. The ancient pilgrimage route is approached as an extended hiking, biking, or horseback tour. No matter how visitors arrive, Santiago de Compostela is a rewarding destination at the heart of the beautiful Galicia region. 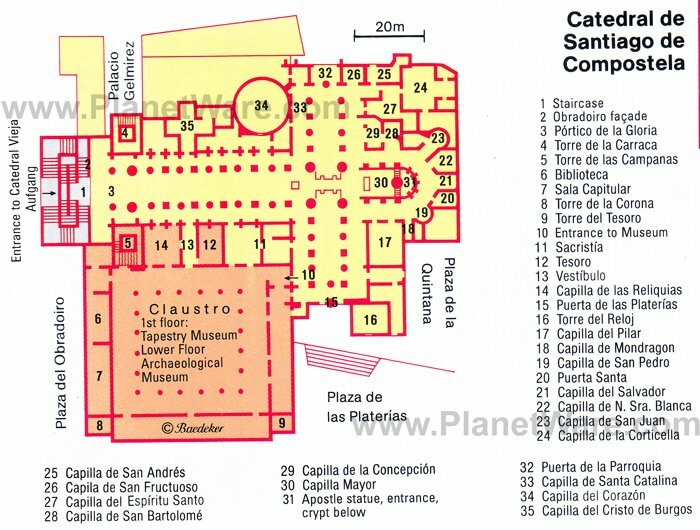 The historic center is a designated UNESCO World Heritage Site, and the magnificent Cathedral of Santiago is one of the most outstanding monuments in Spain. The most sacred Christian monument in Spain, the Cathedral of Santiago de Compostela is a sight worthy of an arduous pilgrim's journey. The cathedral stands majestically on the Plaza del Obradoiro with its towers soaring above the town. An outstanding example of Early Romanesque architecture, the building was constructed between 1075 and 1211 on the site of an earlier ninth-century church that was destroyed in 997 by Almansor's Moorish army. The cathedral was renovated numerous times in different architectural styles, including Gothic, Plateresque, and Neoclassical. Welcoming pilgrims is a splendid entrance called the Portico de la Gloria. Created by Master Mateo in 1188, this doorway is a profusion of sculpture featuring 200 figures from the Apocalypse story and the figure of Saint James the Apostle. The Obradoiro Facade (facing the square) was created by Fernando de Casas y Novoa. This lavish facade is considered to be the finest example of Spanish Baroque style. The cathedral's grand first impression sets the stage for an inspiring spiritual experience. Enter the serene sanctuary, a grandiose space of three naves with an astounding surface area of about 8,300 square meters. Directly beneath the opulent Baroque main altar is the main draw for all pilgrims to Santiago, the Crypt of Saint James the Apostle, patron saint of Spain. The Fiesta de Santiago (Festival of Saint James) is held every year that July 25th falls on a Sunday, considered a Holy Year feast day. The Capilla de las Reliquias, the first chapel in the south aisle, contains tombs of kings and queens of the 12th to 15th centuries. Beyond the south transept to the right of the Puerta de las Platerías is a gorgeous 16th-century Plateresque cloister, one of the largest and finest in Spain. Outside of the cathedral, the Plaza del Obradoiro is a tourist attraction in itself. Several other important monuments grace this square including the Hospital Real, a 15th-century hospital converted to a luxury parador hotel, and the Palacio de Gelmírez, a medieval Archbishop's palace. This former pilgrims' hostel is a splendid example of Gothic Plateresque architecture, with a decorative facade and four interior courtyards. In 1499, the Catholic Monarchs created a lovely place of lodging for weary pilgrims who had journeyed from far and wide on the Way of Saint James trail. It's easy to imagine the joy travelers must have felt when they reached this beautiful destination. Continuing the tradition of hospitality, the historic building has been renovated and converted into a luxurious Parador hotel. Guests will enjoy the comfortable rooms and regional Galician cuisine served at the hotel's gourmet restaurant. Visitors may also continue their spiritual journey by worshiping at the lovely chapel here, the Capilla de Enrique de Egas. The Camino de Santiago is the name for the pilgrimage trail to Santiago de Compostela. This important medieval pilgrimage began in the ninth century with various routes, also known as the Way of Saint James, originating all over Europe. Pilgrims set out on their journeys with the goal of venerating the saint's tomb in Santiago. During the High Middle Ages, a pilgrimage culture flourished, and splendid Romanesque churches were built at key stopping points along the way. The pilgrims' symbol is the scallop shell, and historic sites related to the Camino de Santiago are indicated with a shell icon. Modern day pilgrims tie the scallop shells to their backpacks. The Museum of Pilgrimages allows visitors to discover the fascinating history of the pilgrims of Saint James. The museum explains the importance of the Saint James' relics to the pilgrims and illustrates the cult of Saint James through ancient artifacts and religious objects. Historical information details the origin of Jacobean worship, beginning with the archaeological transfer of the Saint's apostolic body (relics) from Jaffa in the Holy Land to Libredón, the name of the hilltop site that is now part of Santiago de Compostela. Exhibits also show the influence of pilgrimages on the development of Santiago de Compostela's artistic crafts guilds. 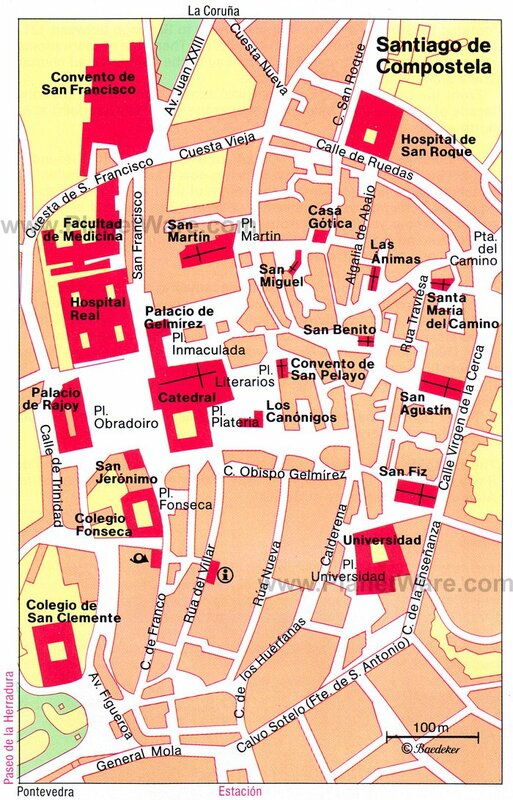 The museum has two sites: One is located on Calle de San Miguel and another at Plaza de las Platerías, the square facing the cathedral. Listed as a UNESCO World Heritage Site, the atmospheric Old Town of Santiago extends south of the cathedral and the Plaza de las Platerías. 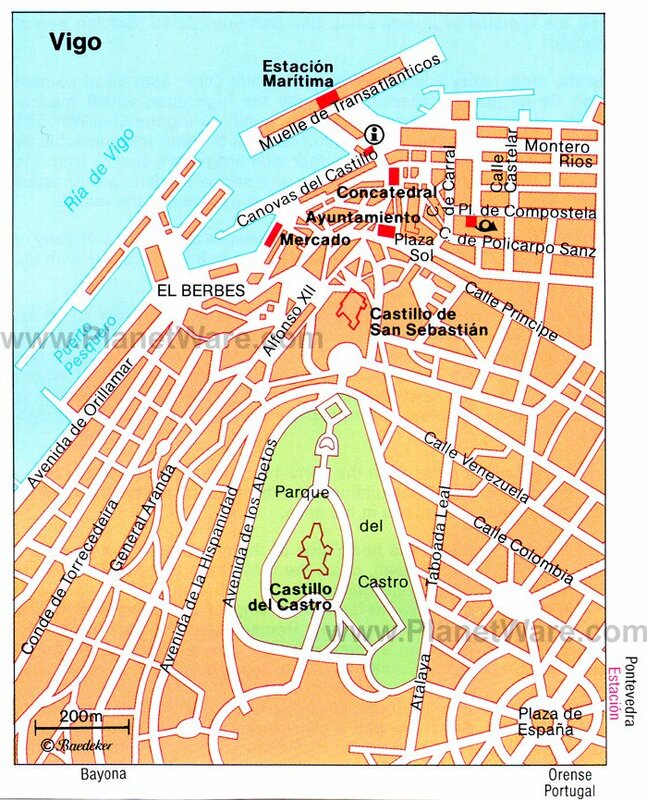 At the center are two parallel streets, the Rúa Nueva and the Rúa del Villar with the 18th-century Casa del Deán at its near end. These two arcaded streets are the hub of the town's life and are filled with cafes, restaurants, and boutiques. Tourists will enjoy strolling around these charming pedestrian streets. Much of the Casco Antiguo and the area around the cathedral is closed to automobile traffic, adding to the quaint Old World ambience. On the outskirts of town, this remarkable Collegiate Church of Santa Maria dates to the 12th century. The building has an interesting tower and flying buttresses on the exterior that were built in the 17th and 18th centuries. Typical of a Romanesque church, the floor plan has three naves separated by pillars, and the capitals are decorated with plant motifs. The sanctuary features barrel vaulting with ribbed arches, creating a graceful sense of spaciousness. The interior is illuminated by the side windows and a rose window. Be sure to visit the cloister, a marvelous example of Romanesque architecture. The arcaded colonnades feature wonderful decorative details and offer views of a peaceful garden. The church is open daily to the public for visits. The Galician Contemporary Art Centre offers a wonderful insight into the modern-day culture of the region. The center is dedicated to contemporary Galician art, which is displayed in sleek exhibition halls. Next to the historic San Domingos de Bonaval Convent, the center occupies a stunning modern building designed by Portuguese architect Alvaro Siza. From the building's terraces, visitors can take in stunning views of the historic quarter. Part of the property includes a lovely park that belonged to the neighboring convent. In addition to the permanent collection, the center also hosts temporary exhibits related to trends in art. The Casa do Cabildo is considered one of the finest examples of Baroque architecture in the Galicia region. This impressive aristocratic house was built in 1758 and is renowned for its exquisite facade that graces the Plaza de las Platerías. The Casa del Cabildo provided inspiration for Spanish author Valle-Inclán and is described in his story Mi Hermana Antonia. The building was renovated in 2011 and converted to an exhibition space; the monument is part of the association of museums in Santiago de Compostela. The Casa do Cabildo is open to the public when art exhibitions are hosted here. Opened in 1976, the Museum of the Galician People is housed in the former convent of Santo Domingo de Bonaval. The exhibits illustrate the defining aspect of Galician culture, such as seafaring and traditional customs. Different rooms present Galician clothes, music, painting, sculpture, architecture, and archaeology. In stunning contrast to the historic buildings of Santiago de Compostela, this sleek modern complex of buildings brings the city into the 21st century. The City of Culture includes a museum that hosts temporary exhibitions, a library, and a central plaza for outdoor performances. The Cidade da Cultura is a short bus ride from the historic town center of Santiago de Compostela. In a dense forest of oak trees, this elegant Galician pazo (palace) was converted from a medieval monastery. San Lorenzo de Trasouto was founded in the 13th century by the bishop of Zamora. Originally, it was a hermitage devoted to Saint Lawrence and was later a Franciscan monastery. The mansion is surrounded by idyllic gardens filled with an abundance of lush plants, trees, and flowers. The palace is used as a venue for weddings, conferences, meetings, and banquets. Tourists may visit the building by appointment. Parador Hostal Dos Reis Catolicos: luxury historic hotel, central location, old-world charm, grand dining room, cloister gardens. San Francisco Hotel Monumento: 4-star hotel, old meets new, glass elevators, stone walls, inviting courtyard, lovely pool. Altair Hotel: mid-range boutique hotel, steps from the old town, excellent staff, stylish decor, amazing breakfast with homemade jams. Hotel Atalaia B&B: budget guesthouse, friendly service, contemporary rooms, comfortable beds. The historic seaside town of Vigo is 87 kilometers from Santiago de Compostela along the Atlantic Ocean shores and the estuary of the Rías Baixas. The town's historic quarter has the ambience of a fishing village. Vigo is renowned for its Galician cuisine based on fresh local fish. The town has an interesting 20th-century church, the shrine of Nosa Señora da Guía, inspired by the Baroque architecture of Santiago de Compostela. Housed in a lovely 17th-century pazo (palace) with gorgeous gardens, the Municipal Museum displays an excellent collection of archaeological findings and paintings by Galician artists. Another interesting cultural attraction is Galicia Marine Museum, which educates visitors about the history of fishing and the traditional seafaring way of life of the Galicia region.